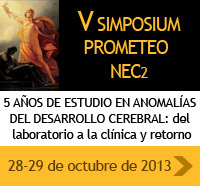 Welcome to the Salvador Martinez's Lab website at the Institute of Neuroscience in Alicante. Our interdisciplinary team is form by several research groups that research to elucidate fundamental mechanisms that control the early steps in the correct patterning of the developing brain, with the focus on localized centers (secondary organizers) found at the forebrain, midbrain and hindbrain. Particular interest are the roles of the secreted molecules (morphogenes) found in the these regions of the brain (FGFs, SHH, WNTs). Our studies extend into the understanding of the disruption of these mechanisms (found as tiny or drastic alterations of particular brain structures and/or mismatch neural layer organization) and most importantly, the relation of these alterations with known human disorders such as autism, schizophrenia and mental retardation. Part of the tools used for this challenge is the Stem Cell Biology, as well as biotechnology related to the development of medical applications of cellular therapy (clinical trials). The main goal of these latter research fields is to provide insights into new inroads for diagnosis, prevention and treatment of these brain congenital alterations, mental and neurodegenerative diseases.